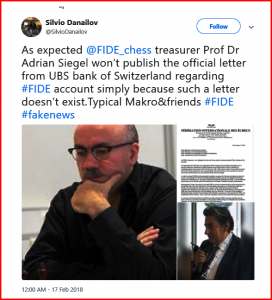 The latest example of dis-information appears to be an over-baked letter dated February 12 from the FIDE treasurer Dr. Adrian Siegel, claiming that FIDE’s bank in Switerzland, UBS, was closing its bank account effective immediately. Dr. Siegel presented no evidence to back up this claim. When contacted, a UBS spokesperson refused to confirm or deny the allegation, stating that any information about clients’ accounts is confidential. Readers will recall that news of the February 12 letter quickly spread thru MSM, none of which questioned the veracity of the facts. Today, 4 days later, calmer heads prevail and now calls for the treasurer’s resignation are beginning to be heard. I will keep my readers up to date as this story develops. Readers might also want to take a quick peek at a shoddy piece of journalism over at Chess.Com by Peter Dogger where he quotes the disgraced FIDE treasurer as saying that MSM’s coverage on the subject was all based on ‘a misunderstanding’. 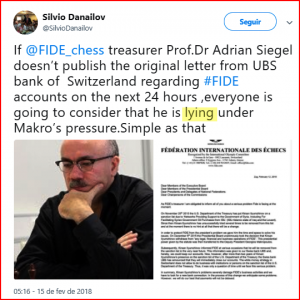 Famous last words…the sad truth is that Siegel has absolutely no credibilty left after screwing and misleading everybody: Kirsan, UBS, Reuters, The Telegraph Bloomberg and numerous other MSM icons, as well as the entire gullible online chess community.